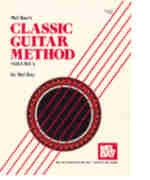 Complete in three volumes, this widely used text presents classical guitar instruction in a logical and clear manner. The student is thoroughly grounded in left and right hand technical studies and is acquainted with the works of the masters. In notation only.